Several years ago, it was revealed that the majority of known natural globular proteins can be considered to be combinations of closed loops of an approximately standard size (25 - 35 amino acids (aa)). This discovery was based on polypeptide chain statistics . The discovery was applied toward the understanding of the protein folding mechanism [2,3], protein structural organization [2,4] and protein evolution [5,6]. It was proposed that closed loops of an optimal size were an important stage in protein evolution. At that particular stage, the natural proteins were small molecules (25 - 35 amino acids in size) in which the turning of the backbone back onto itself (i.e., the formation of closed loops) could be an important selective advantage that provided stability to the molecule. In the next stage, these small proteins made of one closed loop united to form modern-sized domains (50 - 300 aa). The main hypothesis is that the closed loops, being elementary protein modules, at least partially conserved their ancestral structural and functional properties in modern proteins. Presumably, such modules can be classified into a limited number of families, which each originate from a corresponding, early ancestor protein formed from a single closed-loop protein. Such types of primary conserved families have already been described [7,8]. Thus, the presentation of proteins as a set of closed-loop, conserved, standard-sized modules would be very useful for protein characterisation and classification and for understanding protein evolution. The first, pared-down version of the site was created in 2005. Recently, the site was considerably improved and a new, important, theoretical investigation related to the topic of the site was performed. The improvement and investigation were the reasons to write this paper. The first paper about the web server (DHcL), which implements the decomposition of a protein into a set of closed loops, was published in 2008 . This server demonstrates a set of the best loops (with the smallest distances between ends and allowing a small overlap of 5 aa) rather than the optimal decomposition of non-overlapping loops (as our web server does). We will discuss the differences in detail in the Results section. In this paper, the manual for HoPLLS (Hierarchy of protein loop-lock structures) is given, and the applied algorithms are described. We also present the results of the application of HoPLLS to the creation of a full library of protein-building, closedloop elements. This data can be used to find a new structural alphabet [7,8] based on the conserved modules and can be used for protein annotation and comparison. In the loop-lock representation, we consider a protein to be a set of closed loops [5-7]. We name the place where the ends of a loop meet each other a van der Waals lock [10,11]. The lock area is +/– Lr (“the lock radius” ) relative to the position of each end of the loop. Lr is equal to 1 amino acid, 2 amino acids or 3 amino acids. In this paper, we present algorithms to decompose a protein into a set of non-overlapping loops. We implemented two loop decomposition approaches. The first approach (the geometrical algorithm) is based on minimising lock distances (distance between two ends of the loop) and maximising coverage of the protein with loops. We give priority to loops with smaller distances between the Cα atoms at the ends of the loops and with longer lengths. 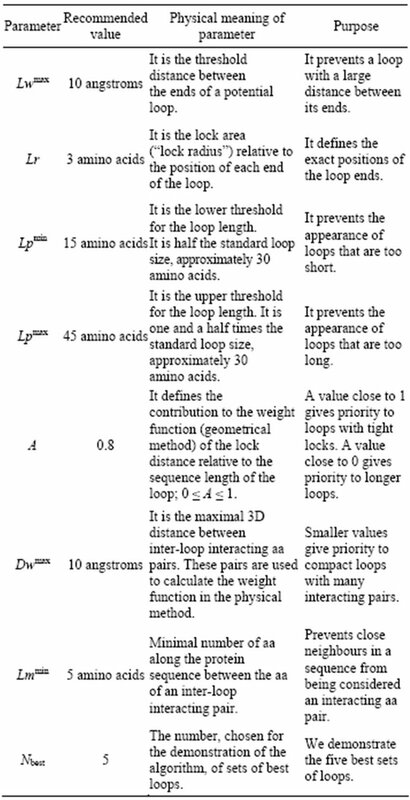 The second approach (the physical algorithm) is based on the loop density criteria, i.e., finding a set of loops with the maximum number of internal links (not only links at the ends). Internal links are pairs of Cα atoms separated by a small distance in 3D space and by a long distance along the protein. In both approaches, we bounded the loop size by minimal and maximal values. Both the discussed algorithms are novel and were not considered previously. We now describe these two algorithms in detail. where j is the number of the current loop. where A defines the contribution of the lock distances relative to the sequence length of the loops. where J = [J1, J2, ∙∙∙, JM] is the set of the loop indexes. 3) We find a set Jbest of non-overlapping potential loops that have the maximum combined weight among all the possible non-overlapping loop sets. where argmax is a function that gives the J value at which the function W(J) has its maximum. This procedure is performed in linear time and follows the description in . In fact, in this paper, we used a part of the algorithm described in Chapter 2 (“A linear time maximum weight independent algorithm”) of . For some weighted interval graph, the algorithm searches for the maximum weight set of non-overlapping intervals with the maximum weight. 4) We find the second-best loop decomposition, the third-best loop decomposition, etc. (see below). 1) For a given three-dimensional protein structure, we find all the fragments (potential loops, which possibly overlap with each other) in which the distance between the ends is less than the threshold Lwmax; see Equation (1) (The distance is not necessarily the local minimum in the distance space). The sequence length (Lpj) is limited by the upper threshold Lpmax and the lower threshold Lpmin; see Equation (2). e) The inter-loop interacting pair is the geometrically closest amino acids (except for the previously found amino acids) of the loop that satisfy the above conditions. This procedure is done in linear time and follows the same above-mentioned description . Let us consider a pool of all the possible loops for a given protein chain. The loops can be distinctive or can overlap with each other. We also have the optimal, i.e. maximal weight, set of non-overlapping loops from the loops belonging to the pool. Our objective is to find the second-best set of non-overlapping loops, the third-best set of non-overlapping loops and so on. The second-best set must be different from the first set by at least one loop. Therefore, we can find the second-best set by excluding from the pool the loops that belong to the optimal set one by one; we then search, as described above, for the maximum-weight, non-overlapping loop set in the pool that is reduced by one loop each time. If there are N loops in the first (best) set, then we have N variants after excluding each loop once. The maximum weight set from the search over all the variants is the second-best loop set. We put the remaining sets that were not chosen into the collection of candidates. Note that if the second-best set is different from the optimal set by more than one loop (the degenerate case), we will obtain the same set a number of times equal to the number of different loops. The third-best loop set should be different from the first and the second best sets by at least one loop. Hence we exclude from the pool the same loop that was excluded to obtain the second-best set. In addition, we exclude the loops belonging to the second best set, one by one, and renew the search for the maximum-weight, nonoverlapping loop set. The third-best set is the set with the maximum weight from the results of the exclusions at this stage and from the sets within the collection of candidates. We add the sets produced in this stage that were not chosen to the collection of candidates. If we have the above-defined degenerate case, the thirdbest set will be the same as the second-best set. In this case, we omit this result and begin to look for the nextbest set. The next-best sets that follow can be extracted by a similar procedure. Visualisation of HoPLLS results requires the Chime program to be downloaded (http://www.umass.edu/microbio/ chime/getchime.htm). This program helps Internet Explorer visualise 3D molecular structures written in pdb format. 10) Download Acrobat: download Acrobat reader. 3) to input the PDB code (4 characters: 4 tim, for example). The HoPLLS routine loads this protein from the Protein Data Bank (http://www.rcsb.org/pdb/home/home.do). An example of the output page is shown in Figure 2. The output includes the top five decompositions for every protein chain. The output lists the loops with the numbers of the first and the last amino acids; underneath, the image of the protein is given with the loops shown in different colours. The Chime program allows us to rotate the protein in 3D (in the image) with the computer mouse. Consider for example the 4 tim protein (Chain A), which forms a TIM-barrel fold, decomposed by HoPLLS with the geometrical algorithm at the recommended parameters. The results for the closed-loop decomposition by the geometrical algorithm are shown in Figure 3. The results for the same task performed by the DHcL server  are shown in Figure 4. This server uses a rather simple procedure for loop selection; it allows overlaps (five amino acids) and provides only one possible set of loops. This server repeatedly starts from the “better” loop (i.e., the tightest loop with the shortest Cα-Cα distance between the ends), and at each iteration, the sequence region corresponding to the mapped loop is excluded from further consideration. In contrast, our server, HoPLLS, finds an optimal nonoverlapping set by weighting the loops. In addition, HoPPLS provides several suboptimal sets through the algorithm for finding a Maximum Weight 2—Independent Set on Interval Graphs . Figure 1. 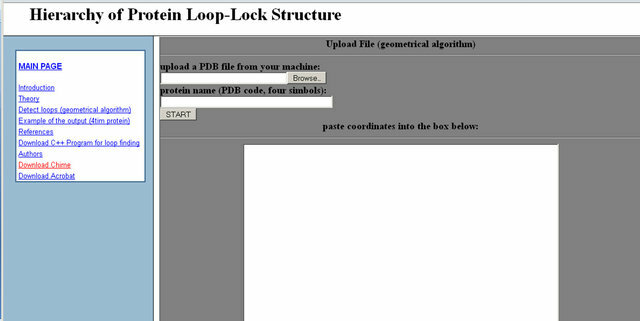 The “Detect loop” page to input a protein for detection of the loop-lock structure. Figure 2. Output page for the algorithm (for the loop-lock structural decomposition). lection. In the current case, the main reason for the difference is the following: we do not allow loops to overlap, whereas with DHcL, loop overlaps are possible. This difference explains the larger number of loops obtained with DHcL than obtained with HoPLLS. Previously, it was proposed that a limited number of ancestral closed loops existed in the form of individual molecules and appear today as the structural elements of modern proteins, although their sequences and 3D structures have undergone significant changes during evolution. Detecting the different fragments in modern proteins that correspond to a closed loop ancestor is a challenging task. There are generally two main approaches to detect this correspondence. The first approach is from sequence to structure. Several studies have been published in this field [7,8,13], and several primary ancestral closed loops have been already described. The second approach is from structure to sequence. This approach requires the extraction of loops from 3D protein structures prior to analysis of the sequences of these structures, as performed in . We have applied our geometrical algorithm for loop extraction to approximately 6000 proteins from the PDB. These proteins have been decomposed into approximately 100,000 loops. 3) If a small number of such consensus sequences actually exist, we can find some correspondent sequence in a protein and predict the possible position of the loop from the 1D structure. 3) Return to the first step and repeat until the set is empty. If such an “alphabet” of loops actually exists, they can be clustered into a small number of groups in such a way that all the loops in the same group are close to each other. Because the probability of random closeness is 1/100,000, in the absence of any “alphabet”, we expect to form about 50,000 groups with a uniform distribution of the number of loops over the groups. Figure 3. Five sets for the loop decomposition of Chain A of 4 tim; the last two loop sets differ in Loop 6. The loop colours are: 1 blue, 2 red, 3 chlorine, 4 brown, 5 red, 6 violets, and 7 yellow. Figure 4. The decomposition of the loops of Chain A from the DHcL  web server. 30,000. Most of the groups included three loops. The maximal number of loops in a group was twenty. We also used a “binary” code model [16,17], in which 20 amino acids were divided into two groups that originated from the ALA and GLY amino acids. In the “binary” code case, two sequences were said to be close if they retained at least 90% similarity. Similarly to the 20 amino acids code, the probability of this occurring randomly in the “binary” code case is approximately 1/100,000. The number of groups found by the “binary” code was about 50,000. Most of the groups included two loops. The maximal number of loops in a group was nine. The results demonstrate that the loop distribution is approximately random and that no “alphabet” of loops actually exists. We also tried to find an “alphabet” of locks. The lock is defined to be the last three or five amino acids on both ends of the loop. The number of groups found in the lock-clustering experiments was found to be approximately the value expected for a random distribution: indeed, almost all combinations of amino acids were found with an approximately uniform distribution of lock numbers. These results show that closed loop selection by our algorithm does not make it possible to decompose the complete set of loops into a small number of groups based on sequence similarity. This impossibility may exist because too many evolutionary changes have occurred in the primary closed loop ancestors. It is possible that more complicated procedures than direct sequence comparison should be applied. It is well known that the same structure and even the same function often can be presented in nature by different sequences [14,18,19]; i.e., the sequence diversity in protein sequences is very high. A promising approach to overcome this problem is to define sequence relatedness in terms of connectivity through sequence similarity networks, as was proposed recently . It was found that the natural sequence fragments form prolonged “walks” (connected through the networks), in which one sequence smoothly transforms to another one while conserving its structure and function. Remarkably, the sequences at the ends of such walks (on the periphery of the networks) are often completely different [20,21]. Several examples of completely unmatched sequences from the same network are documented [21,22], and many more can easily be found in the networks. In many cases, these networks allow researchers to overcome the problem of sequence diversity and suggest a new criterion for sequence relatedness. In addition, these networks provide an alternative approach to all the methods in which notions of “sequence pattern” or “profile” and PSSM are used, e.g., [23,24]. These notions imply an “average state” of sequences, whereas the network approach simultaneously considers a complete list, often of samples rather than different sequences linked to a common specific structure and function. This list may correspond to different “average states” yet be connected together through chains (walks) of pair-wise close similarities, which suggests evolutionary connections between the “average states”. The same function for a given segment may be encoded by different consensus sequences. Moreover, in some cases a consensus may not exist at all. In this paper, we described two algorithms for the closedloop decomposition of 3D protein structures and a web server for the application of these algorithms. On the basis of the developed tools, a full collection of closed loops was investigated. The simple possibilities for finding an alphabet of loops and locks were verified. The future steps in this direction were considered. We thank Prof. E. N. Trifonov for supervision during this project. This work has been supported by the European Union Seventh Framework Program through the PathoSys project (grant number 260429).